At Soo Overhear Doors Inc, we provide top-of-the-line products and services to the residents and building owners of Sault Ste. Marie and the surrounding areas. Our team of salesmen will gladly walk you through the process of purchasing a garage door system, and our technicians are extremely knowledgeable regarding overhead door repair and garage door installation of any brand. For your residential, commercial, industrial or agricultural projects, you can count on us to deliver fast and courteous service! 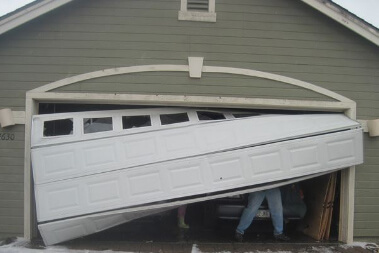 Do you have a problem with your garage door? Make a bothersome thudding noise? Open and close by itself? Seem very heavy to open? Stop before touching the floor? Whatever request you may have, we will make your door work! As certified Garaga Experts, meet the highest levels of professionalism. Are qualified technicians and installers. Give the best advice because we know our products from top to bottom. Are courteous, rapid and thorough. Cover the residential, commercial, industrial and agricultural sectors. Serve: Sault Ste. Marie, Elliot Lake, Blind River areas. Can be quickly reached online to schedule an appointment. Garage door repair and garage door opener repair of any brand. Garage door parts replacement and accessories. And last, we love what we are doing! Your garage door can be equipped with either a belt drive or chain drive garage door opener. Both perform equally well, but a chain drive operator will require slightly more maintenance since the chain must be lubricated once in a while. 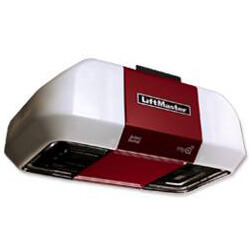 At Soo Overhear Doors Inc, we use LiftMaster openers because they are reliable, and we encounter very few problems with them. If a problem were to happen with your garage door opener, it would most likely that the photocells are obstructed or misaligned, or that the voltage of the radio transmitter batteries is too low, all problems which can easily be resolved by a member of our team of technicians. One important feature of your garage door opener is the safety release feature. Every overhead garage door is equipped with one, but it is not always properly inspected and maintained. In the event of a power failure, if your garage door opener does not have a battery backup, you will need to go inside your garage to pull the emergency release in order to open or close your garage door. It is a function that needs to be in good working condition, and that will save you a lot of trouble in the event of a storm. Contact Soo Overhear Doors Inc for all garage door repair needs and garage door opener in the Sault Ste. Marie area, and our team will gladly come to your home to inspect your system, find the problem, and fix it in no time. We also offer preventive maintenance programs, which mean that we perform a check up on your door yearly to ensure that all parts are moving freely. To schedule a service call or a preventive maintenance program, do not hesitate to contact us!